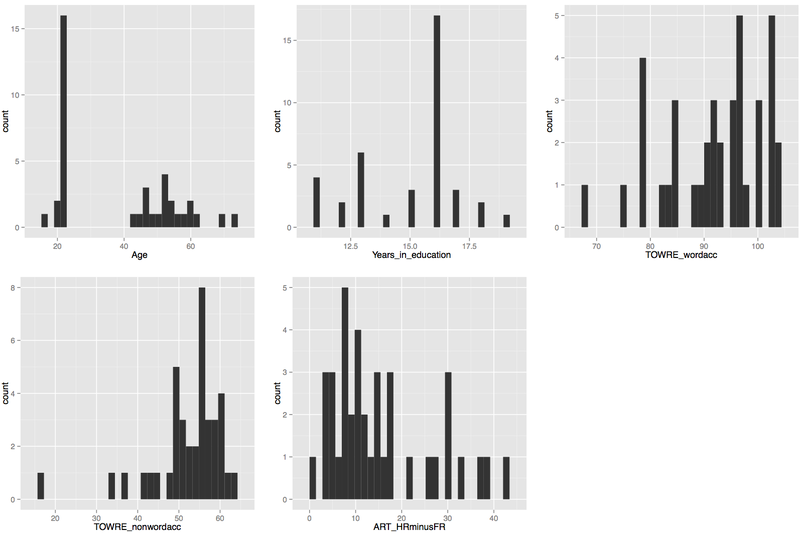 In this post, we shall 1. load data into R workspace; 2. get summary statistics for those data; 3. plot visualizations of the data distributions — histograms; and 4. finish up by closing and saving the .R file. For this post, I am going to assume that you know about files, folders and directories on your computer. In Windows (e.g. in XP and 7), you should be familiar with Windows Explorer. (For Macs, we would be working with Finder and within Finder with F+Get Info.) If you are not familiar with Windows Explorer, this series of videos e.g. here on Windows Explorer should get you to where you understand: the difference between a file and a folder; file types; the navigation, file folder directory; how to get the details view of files in folders; how to sort e.g. by name or date in folders. N.B. the screenshots of folders in the following will look different to you compared to Windows Explorer as it normally appears in Windows 7. That is because I use xplorer2, as I find it easier to move stuff around. Just as in other statistics applications e.g. SPSS, data can be entered manually, or imported from an external source. Here I will talk about: 1. loading files into the R workspace as dataframe object; 2. getting summary statistics for the variables in the dataframe; 3. and plotting visualization of data distributions that will be helpful to making sense of the dataframe. I often do data collection using paper-and-pencil standardized tests of reading ability and also DMDX scripts running e.g. a lexical decision task testing online visual word recognition. Typically, I end up with an excel spreadsheet file called subject scores 210413.xlsx and a DMDX output data file called lexical decision experiment 210413.azk. I’ll talk about the experimental data collection data files another time. — which you can download here. These data were collected in an experimental study of reading, the ML study. The file is in .csv (comma separated values) format. I find this format easy to use in my workflow –collect data–tidy in excel–output to csv–read into R–analyse in R, but you can get any kind of data you can think of into R (SPSS .sav or .dat, .xlsx, stuff from the internet — no problem). Let’s assume you’ve just downloaded the database and, in Windows, it has ended up in your downloads folder. I will make life easier for myself by copying the file into a folder whose location I know. — I know that sounds simple but I often work with collaborators who do not know where their files are. Your lives, and my life, if I am working with you, will be easier if you are systematic and consistent about your folders: if I am supervising you, I expect to see an experiment for each folder, and in that sub-folders for – stimulus set selection; data collection script and materials; raw data files; (tidied) collated data; and analysis. I have talked about the workspace before, here we are getting to load data into it using the functions setwd() and read.csv(). In R, you need to tell it where your data can be found, and where to put the outputs (e.g. pdfs of a plot). You need to tell it the working directory (see my advice earlier about folders): this is going to be the Windows folder where you put the data you wish to analyse. Notice: 1. the address in explorer will have all the slashes facing backwards but “\” in R is a special operator, escape so 2. the address given in setwd() has all slashes facing forward 3. the address is in “” and 4. of course if you spell this wrong R will give you an error message. I tend to copy the address from Windows Explorer, and change the slashes by hand in the R script. 5. … na.strings = “-999” … — I am asking R to code -999 values, where they are found, as NA – in R, NA means Not Available i.e. a missing value. I recommend you try making these errors and getting the error message deliberately. Making errors is a good thing in R.
4. the file name, top of the script window, went from black to red, showing a change has been made but not yet saved. To save a change, keyboard shortcut is CTRL-S. The entities that R creates and manipulates are known as objects. These may be variables, arrays of numbers, character strings, functions, or more general structures built from such components. (alternatively, ls()) can be used to display the names of (most of) the objects which are currently stored within R. The collection of objects currently stored is called the workspace. or this helpful video by ajdamico. So, we have created an object using the read.csv() function. We know that object was a .csv file holding subject scores data. In R, in the workspace, it is an object that is a dataframe, a structure much like the spreadsheets in excel, SPSS etc. : columns are variables and rows are observations, with columns that can correspond to variables of different types (e.g. factors, numbers etc.) Most of the time, we’ll be using dataframes in our analyses. Note: you cannot edit the file in that window, try it. I am going to skip over a whole bunch of stuff on how R deals with data. A useful Quick-R tutorial can be found here. The R-in-Action book, which builds on that website, will tell you that R has a wide variety of objects for holding data: scalars, vectors, matrices, arrays, dataframes, and lists. I mostly work with dataframes and vectors, so that’s mostly what we’ll encounter here. 4. str() will tell you if variables are factors, integers etc. If I were writing a report on this subjects data I would copy the output from describe() into excel, format it for APA, and stick it in a word document. These summary statistics will not give you the whole picture that you need. Mean estimates of the centre of the data distribution can be deceptive, hiding pathologies like multimodality, skew, and so on. What we really need to do is to look at the distributions of the data and, unsurprisingly, in R, the tools for doing so are excellent. Let’s start with histograms. 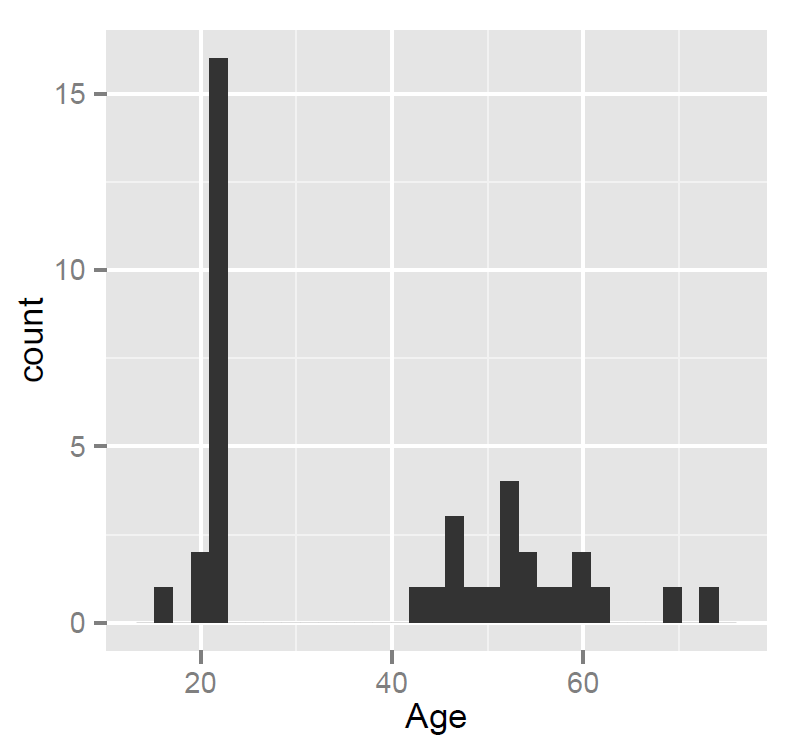 — We are asking ggplot() to map the Age variable to the x-axis i.e. we are asking for a presentation of one variable. — In my opinion, at least one variable has a value that merits further thought. 4. What do you do when you’re finished? — you’ll be asked if you want to save the plot as an image (you’ll then be asked what format you want, .jpeg and .png are good for most purposes), as a pdf (my preference), or copy it to the clipboard so that you can paste it somewhere (like a word document, I suppose). — And save it to where you can find it. The R code used in this post can be downloaded here. Download it and use it with the database provided. 1. Putting data files into folders on your computer. 2. 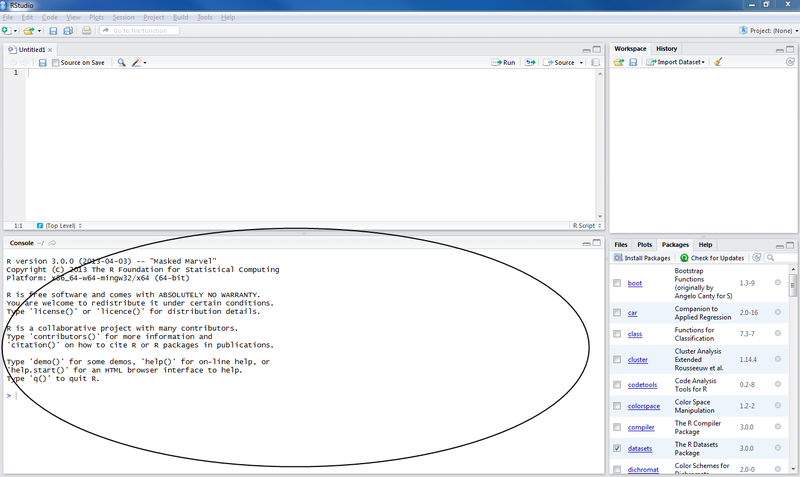 The workspace, the working directory and how to set it in R using setwd(). 3. How to read a file into the workspace (from the working directory = folder on your computer) using read.csv(). 4. How to inspect the dataframe object using functions like summary() or describe(). 5. 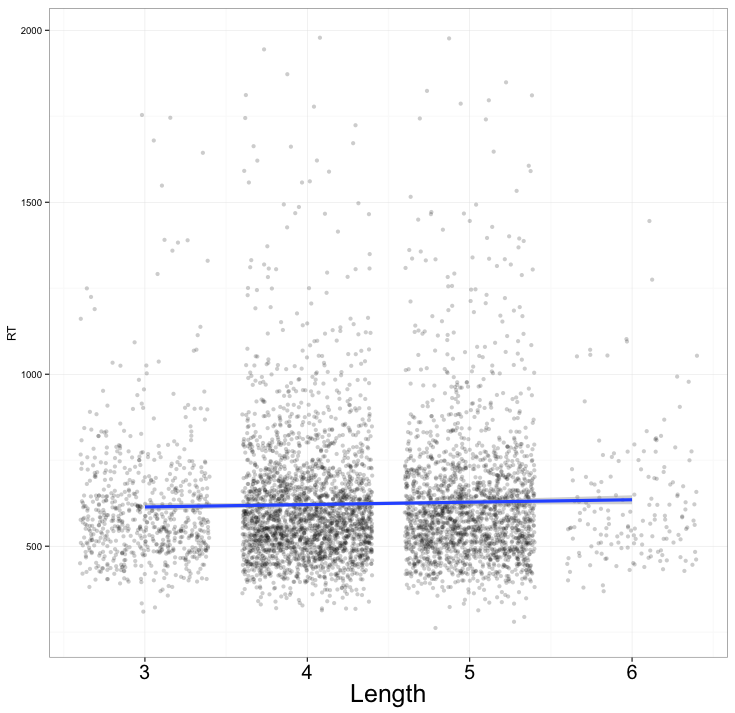 How to plot histograms to examine the distributions of variables. As we get started, we will need help, let’s work on how and where to find that help, and also how to act on it. You need help most of the time when using a software programme, but if you’re getting started on R you don’t have the advantage of practice that you have with MS Word or Excel or SPSS. Needing help is not an R thing, it’s a learning thing. However, there being lots of help available is an R thing. — The first is usually when I a trying to do something and I have a specific problem I need help on. — The second is when I am not really sure what I need or even if I need help. I’ll talk about getting advice and also dealing with it. R is a case-sensitive, interpreted language. – This means that if you spell an object name incorrectly, if you get the syntax wrong, if you muddle letter case, you will get an error (just like any natural language). The error messages can be cryptic. — You can see in the message that the (first) problem is the bracket is wrong. How do I work out what to do? First, more than likely, I am trying something out but I have beside me a book or a website I am working from, maybe trying an example: so if I got a message like this I would check that I copied the code correctly. 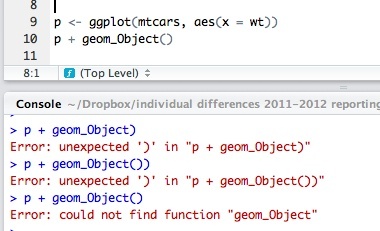 Second, I might try to google the error message “Error: unexpected ‘)’ in “p + geom_Object)” — try it — it does not get me very far in this case. — The obvious response to the error message was to close the brackets — even minimal experience with R will tell you that open brackets are not doing much good. — Sometimes, that quick response will solve the problem straightaway. — “could not find function” — so obviously, I am still not getting the function name right — actually, I get the case wrong. — But let’s say I am convinced I have it right: what should I do? — Google it — most of the time, reasonably careful reading of the result will tell you what’s going on. As noted previously, there are plenty of places to get help, see also following, but one place you should know to look in is the built-in R help. — Notice that you get the help(ggplot) command being shown in the console in blue, it has been executed, but the result appears on the right, in the Help window. 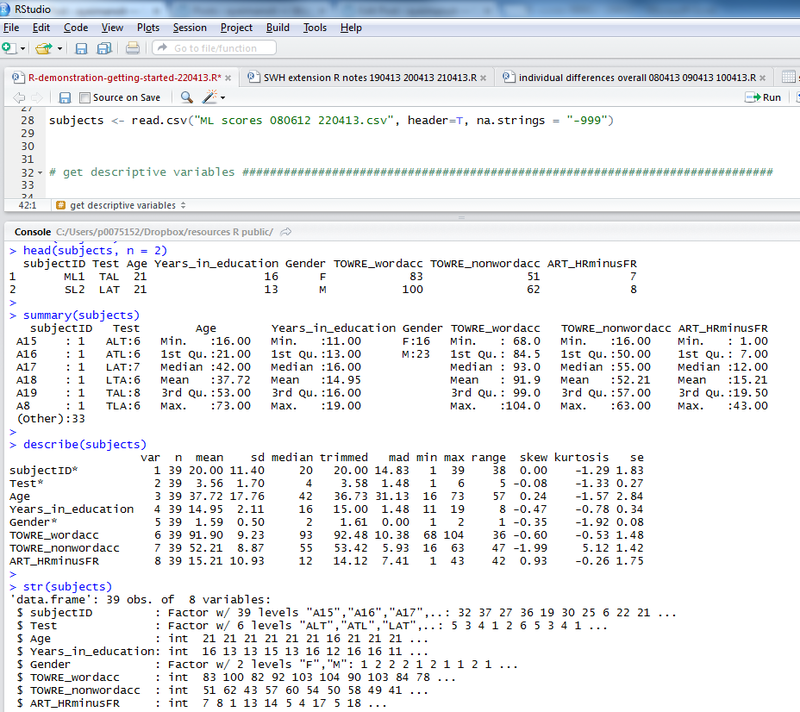 The built-in help in R, accessed by running a help([function name) or ? [function name] command, has a standard structure, it is useful but not (I admit) always terribly friendly. I usually use it if I basically know what the function is for and why I am using it but I want to use the function in a specific way or a different way than default. The help will tell you: 1. what the function does 2. what arguments can be passed to it to work 3. how it can be specified in various ways; and 4. it will give you some example code to try out. The example code will work with built-in data and usually, I learn the most by playing with the example. 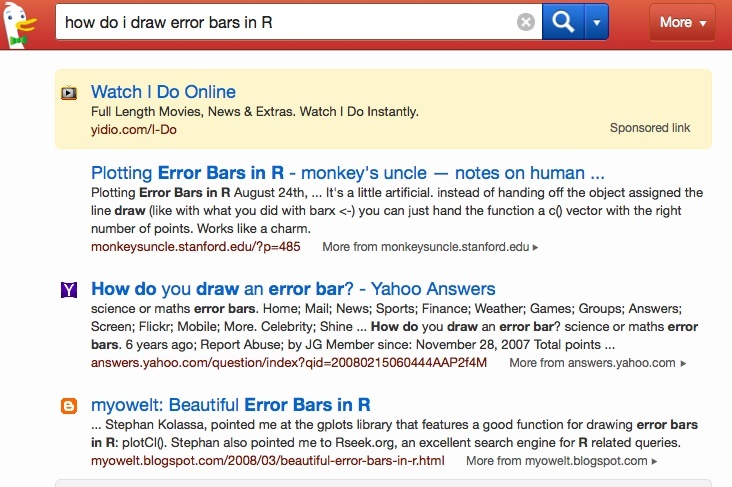 Note that a google search in a form something like this: “in R [name of function or text of error message]” will very often take you to a post on stackoverflow or some R blog where the error or problem and the solution or multiple alternate solutions (this is R) will be described or explained for you. Try it out. 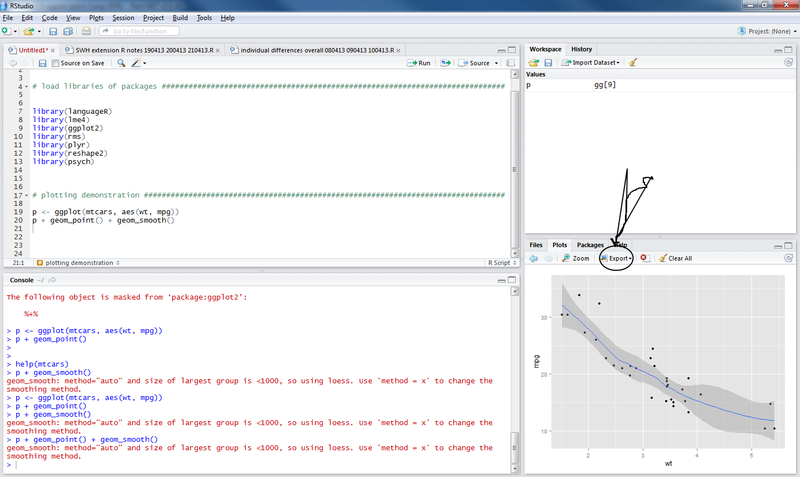 Learning how to use R involves some experimentation. Copy the code from a reported solution into a script, try running it and see if it works. Every problem you ever have will already have been solved by someone else and, in R, the solution will be reported online. Most modern software applications strive to ensure we get what we want without thinking too much about either the ends or the means. An application might, as soon as we start it, ask us what we want or show us what we might want: to write a letter; to input data; to read our emails. In R, you’re the boss of you and with power comes responsibility. Most applications will give you one way to do any thing. In R, you will usually have more than one (often, several) different ways to do a thing. – Which way do you choose? This is a decision based on (for me) answers to the questions: does it work (now)? do I understand why it works? do I like it? 1. I am reading a book e.g. 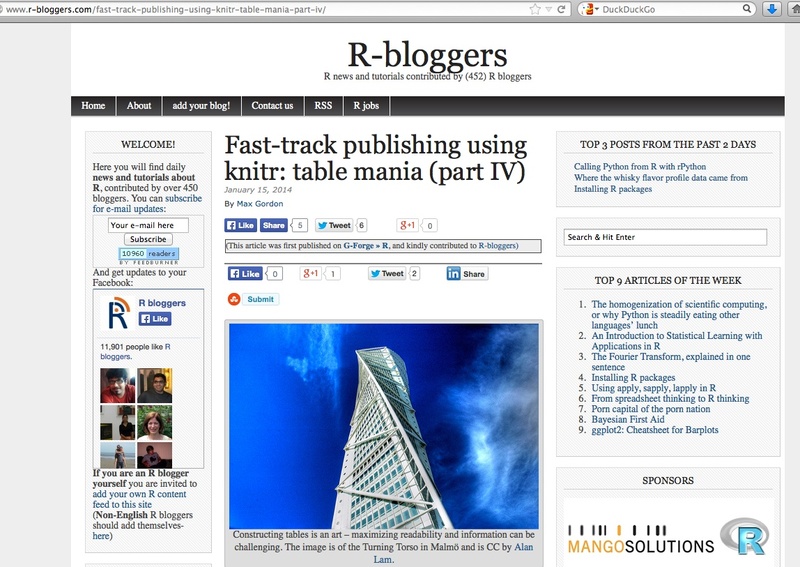 “R in Action” by Kabacoff on a topic relevant to my current task, e.g. on how to manipulate the structure of a dataframe, and I see a description of something I need to do, so I follow the example (code is given, operating on built-in data) and then adapt the code (e.g. changing variable names) to do that action for my own data. I use DuckDuckGo instead of Google but the result will be similar whatever your search engine. Typing a description of a problem or a question will often bring up a lot of results so I look for whatever seems promising, start reading it and then if I can understand the advice, and think I like the look of the results, I copy the code (code is always provided) to try the suggested solution. Note you sometimes get alternate solutions getting offered in the comments. — This discussion was posted to StackOverflow in response to the question. You can see that one of the commentators did not think the person asking the question should even be using setwd(). While another commentator did think setwd() was useful. I agree with the second, but I note this to indicate that there is plenty of discussion, and often alternate solutions, for any one question you might have. For example, I sometimes need to analyse information ordered by date and I am presenting it how I usually do with a bar chart or a line graph or something but I just don’t think the product feels right. What I might do, and what I used to do a lot, is have a look around for inspiration among the various R online aggregations of advice and tips. — which looks pretty cool, and of course comes with a code example you can try out. — coincidentally, a post by Max Gordon on a topic I was disussing yesterday: how can I produce a complete article, tabled statistics and text from inside R? You will need help in R, but there is a lot of it and you can just work on how and where to find it, then what to do with it. 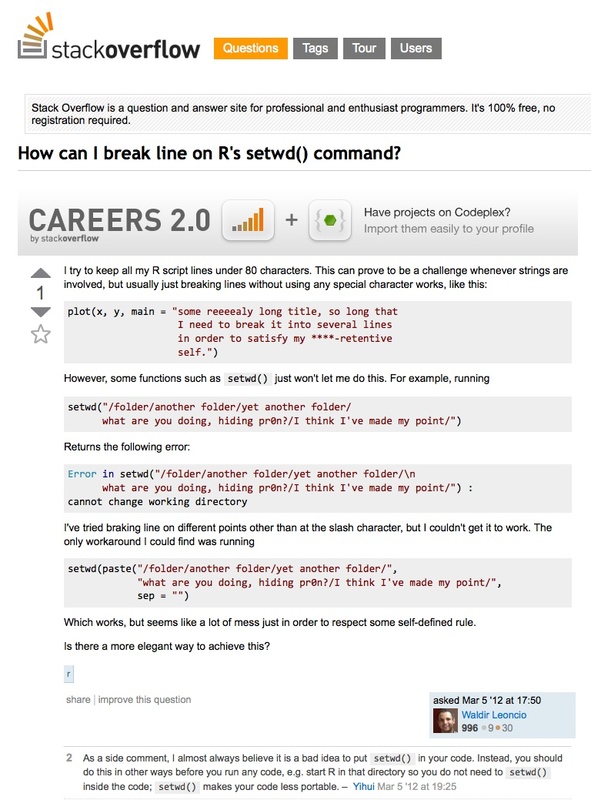 Revise how to install R, as previously discussed here and here. How do you download and install R? Google “CRAN” and click on the download link, then follow the instructions (e.g. at “install R for the first time”). 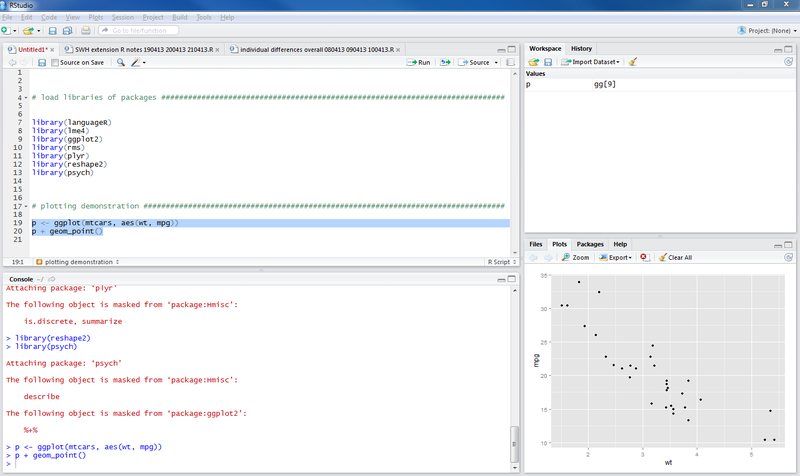 And moonheadsing at Learning Omics has got a blog post with a series of screen-shots showing you how to install R with pictures. 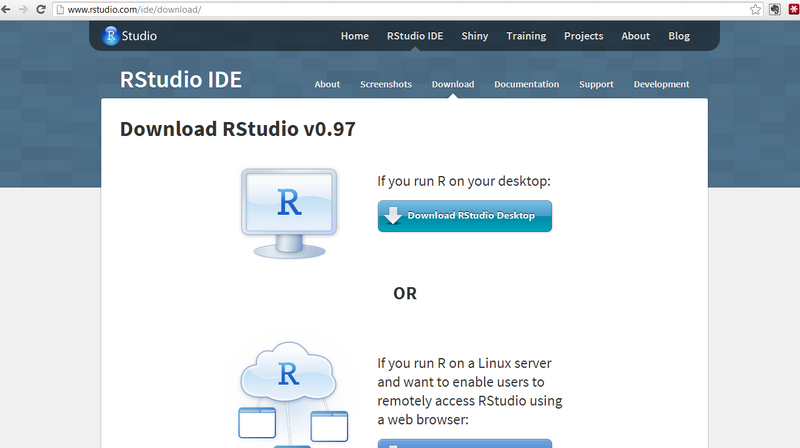 Having installed R, the next thing we will want to do is install R-studio, a popular and useful interface for writing scripts and using R.
You can just click on the link to the installer recommended for your computer. What happens next depends on whether you have administrative/root privileges on your computer. I believe you can install R-studio without such rights using the zip/tarball dowload. Having installed R and R-studio, in Windows you will see these applications now listed as newly installed programs at the start menu. Depending on what you said in the installation process, you might also have icons on your desktop. 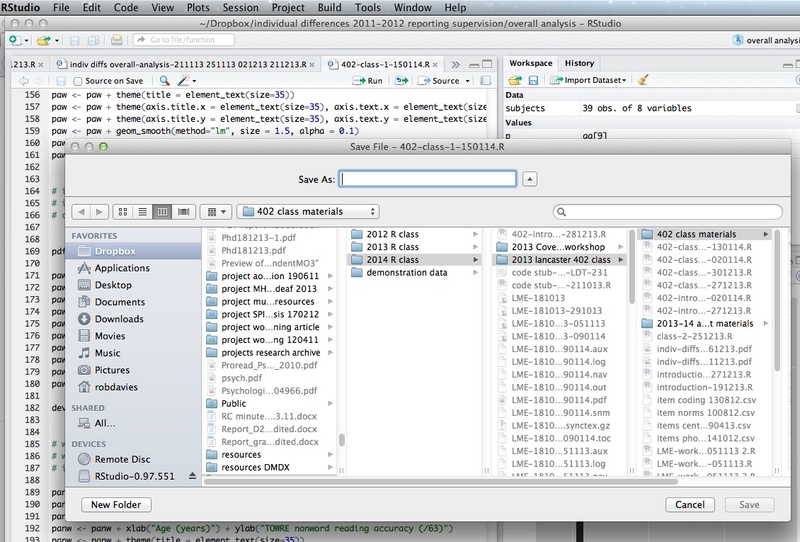 In Mac OS, you will see the R and RStudio icons appear in the applications shown by Launchpad. Go ahead and click on the R icon, check it out, then go to the R menu and click on ‘Quit R’ to leave it, don’t save the workspace image (you’ll be asked if you want to or not). 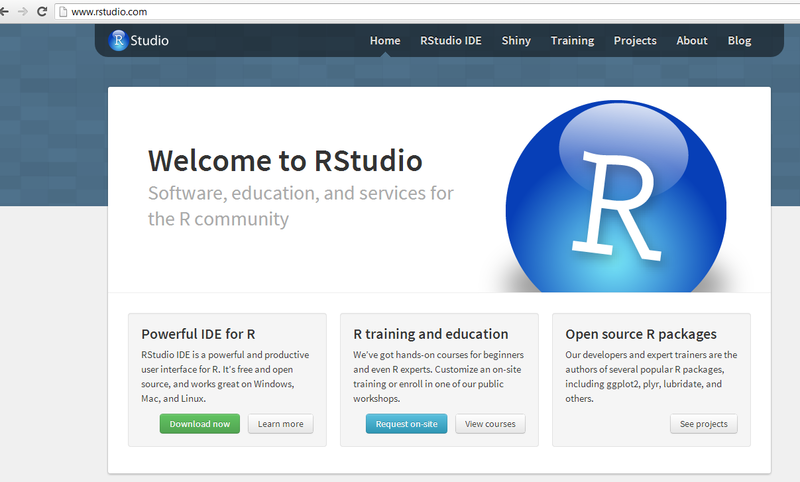 We won’t be using R directly, we will be using it through RStudio. 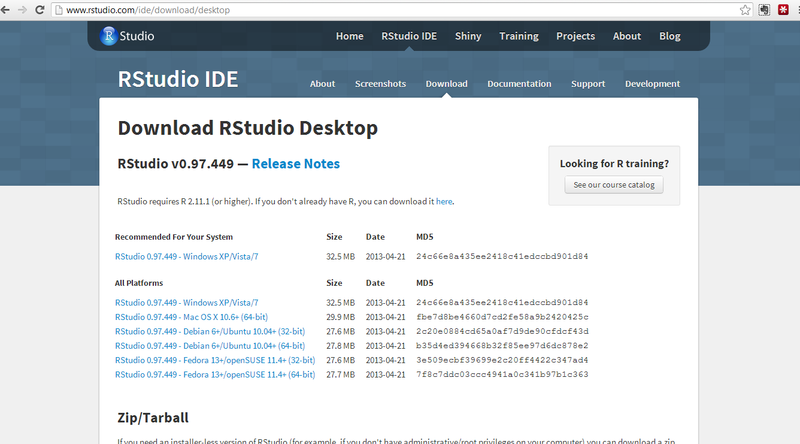 Click on the R-studio icon – it will pick up the R installation for you. Now we are ready to get things done in R.
Here, we are going to 1. start a new script, 2. install then load a library of functions (ggplot2) and 3. use it to draw a plot. Depending on what you did at installation, you can expect to find shortcut links to R (a blue R) and to R-Studio (a shiny blue circle with an R) in the Windows start menu, or as icons on the desktop. To get started, in Windows, double click (left mouse button) on the R-Studio icon. 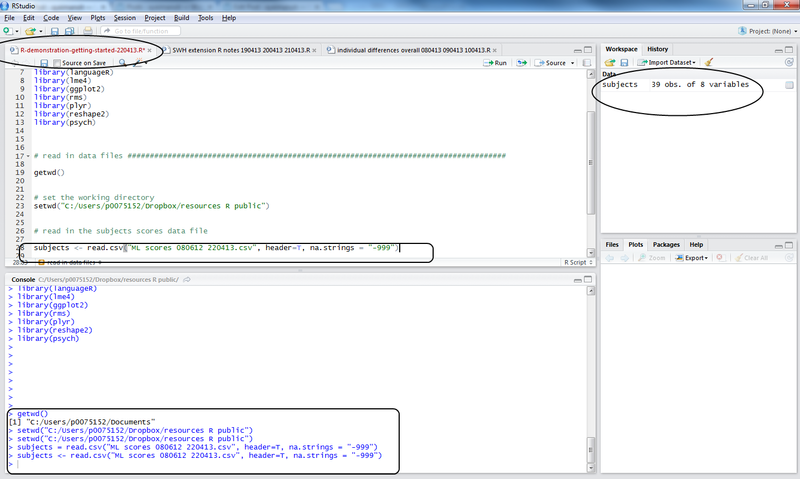 It is what you would see if you open R directly, not using R-Studio. — The console reflects your actions in the script window. 1. Workspace will show you the functions, data files and other objects (e.g. 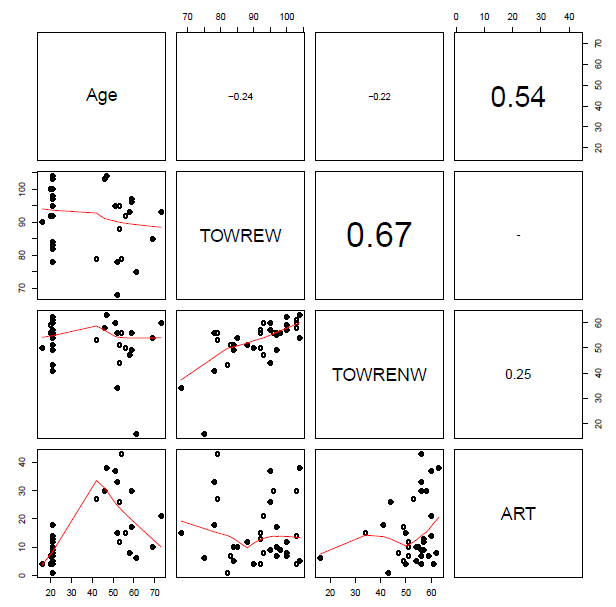 plots, models) that you are creating in your R session. 2. History shows you the commands you execute as you execute them. 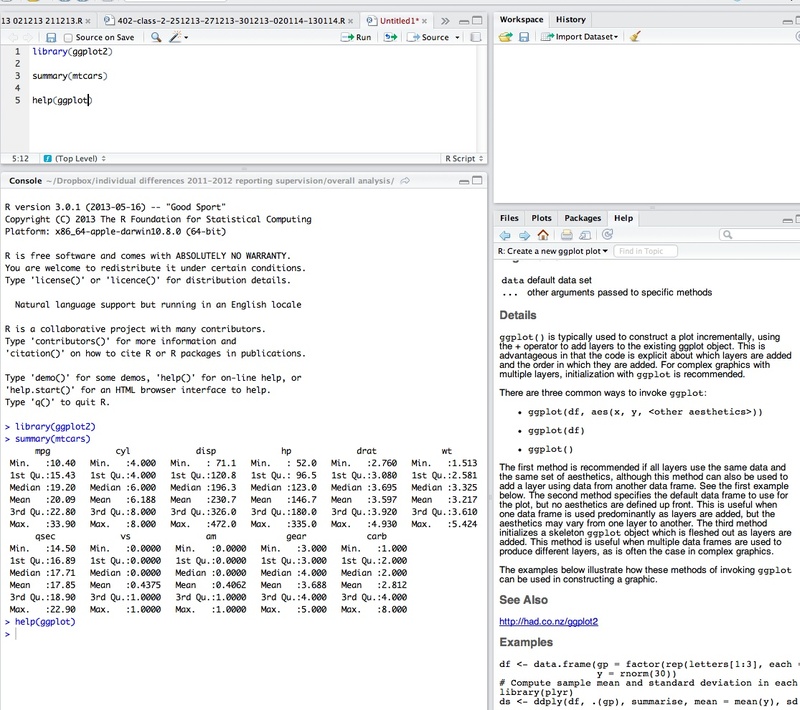 — I look at the Workspace a lot when using R-Studio, and no longer look at (but did once use) History much. My script is my history. We can start by adding some capacity to the version of R we have installed. We install packages of functions that we will be using e.g. packages for drawing plots (ggplot2) or for modelling data (lme4). — and watch the console show you R installing the packages you have requested. Those packages will always be available to you, every time you open R-Studio, provided you load them at the start of your session. There is a 2-minute version of the foregoing laborious step-by-step, by ajdamico, here. N.B. 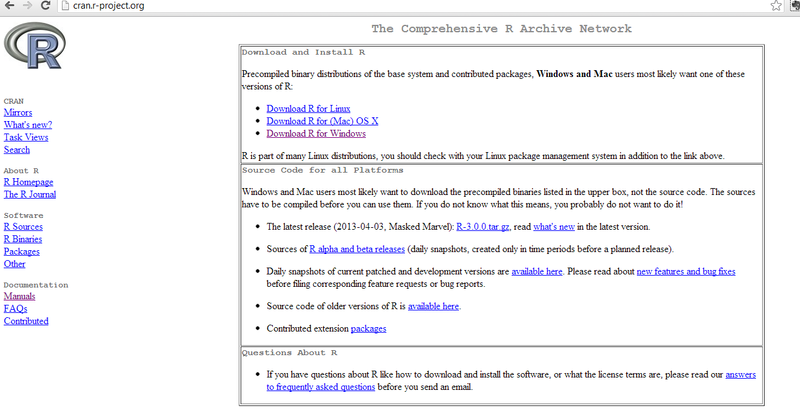 the video is for installing and loading packages using the plain R console but applies equally to R-Studio. Let’s do something interesting now. — notice that the plot window, bottom right, shows you a scatterplot. — aes(wt,mpg) means: map the variables wt and mpg to the aesthetic attributes of the plot. In the ggplot2 book (Wickham, 2009, e.g. pp 12-), the things you see in a plot, the colour, size and shape of the points in a scatterplot, for example, are aesthetic attributes or visual properties. 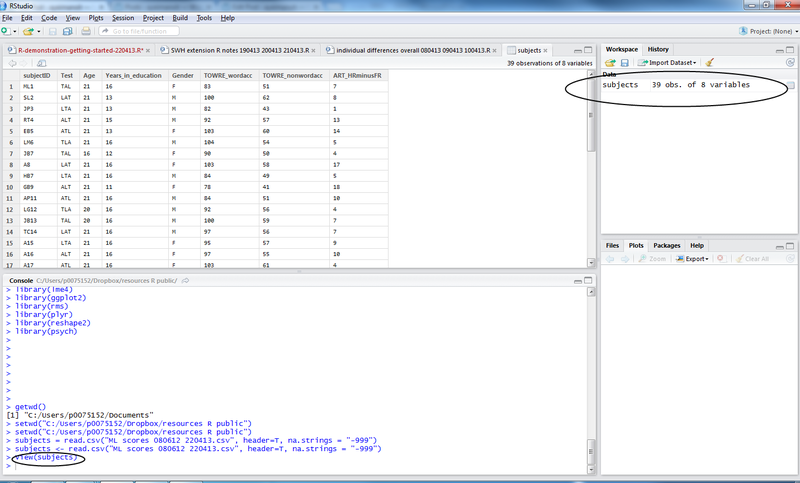 — with aes(wt, mpg) we are informing R(ggplot) that the named variables are the ones to be used to create the plot. Now, what happens next concerns the nature of the plot we want to produce: a scatterplot representing how, for the data we are using, values on one variable relate to values on the other. A scatterplot represents each observation as a point, positioned according to the value of two variables. As well as a horizontal and a vertical position, each point also has a size, a colour and a shape. These attributes are called aesthetics, and are the properties that can be perceived on the graphic. — The observations in the mtcars database are information about cars, including weight (wt) and miles per gallon (mpg). — This bit of the code asked the p object to include two attributes: wt and mpg. — The aesthetics (aes) of the graphic object will be mapped to these variables. — Nothing is seen yet, though the object now exists, until you run the next line of code. The wonderful thing about the ggplot() function is that we can keep adding geoms to modify the plot. adds a loess smoother to the plot, indicating the predicted miles per gallon (mpg) for cars, given the data in mtcars, given a car’s weight (wt). 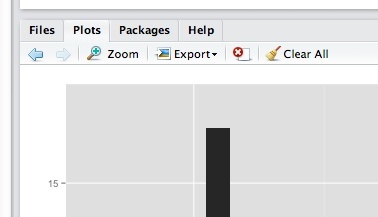 Notice that there is an export button on the top of the plots window pane, click on it and export the plot as a pdf. Where does that pdf get saved to? Good question. I am revising my previous posts on the whole process, from getting started with R to using it to do linear modelling and linear mixed-effects modelling. 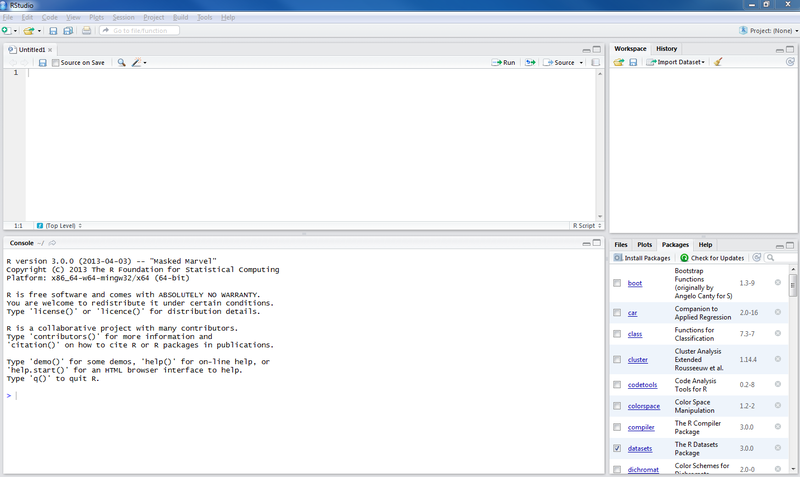 What this revision will entail is some rewriting of .R provided code, some updating, some extension. Extensions will focus on model comparison methods, information criteria approaches to model evaluation, and the choices one must make in data analysis. For an example analysis, we collated a .csv file of data from a repeated measures lexical decision experiment, which can be downloaded here. The code I have used in running the analysis described in this post can be found here. 3. participant responses to words in the lexical decision task. In this post, I want to take a quick look at how you would actually run a mixed-effects model, using the lmer() function furnished by the lme4 package, written by Doug Bates (Bates, 2010 – appears to a preprint of his presumed new book, see also Pinheiro & Bates, 2000). A useful how-to guide, one I followed when I first started doing this kind of modelling, is in Baayen (2008). An excellent, and very highly cited, introduction to mixed-effects modelling for psycholinguistics, is found in Baayen, Davidson & Bates (2008). We start by loading the libraries of functions we are likely to need, defining a set of functions not in libraries, setting the working directory, and loading the dataframe we will work with into the R session workspace. 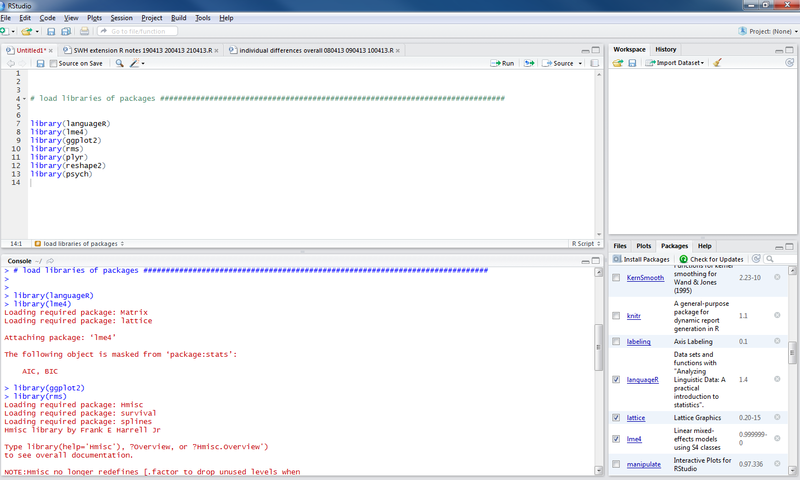 If you run all that code, you will see the dataframes and functions appear listed in the workspace window of R-studio. What I will do next is perform three sets of mixed-effects model analyses. I will talk about the first set in this post. In this first set, I shall compare models varying in the predictor variables included in the model specification. We shall say that models with more predictors are more complex than models with fewer predictors (a subset of the predictors specified for the more complex models). I shall then compare models of differing in complexity to see if increased complexity is justified by improved fit to data. This is in response to: 1. reading Baayen (2008) and Pinheiro & Bates (2000) 2. recommendations by a reviewer; though I note that the reviewer recommendations are, in their application, qualified in my mind by some cautionary comments made by Pinheiro & Bates (2000), and confess that any problems of application or understanding are surely expressions of my misunderstanding. What I am concerned about is the level of complexity that can be justified in the ultimate model by the contribution to improved fit by the model of the observed data. Of course, I have collected a set of predictors guided by theory, custom and practice in my field. But, as you have seen, I might choose to draw on a large set of potential predictors. I know that one cannot – to take one option used widely by psycholinguistics researchers – simply inspect a correlation table, comparing predictors with the outcome variable, and exclude those predictors that do not correlate with the outcome. Harrell (2001) comments that that approach has a biasing effect on the likelihood of detecting an effect that is really there (consuming, ‘ghost degrees of freedom’, or something like that). So what should we do or how should we satisfy ourselves that we should or should not include one or more predictor variables in our models? You could start complex and step backwards to the simplest model that appears justified by model fit to observed data. I will return to that option another time. In this post, I will start with the simplest model and build complexity up. Simpler models can be said to be nested in more complex models, e.g. a simple model including just main effects vs. a more complex model also including interactions. I will add complexity by adding sets of predictors, and I will compare each proximate pair of simple model and more complex model using the Likelihood Ratio Test (Pinheiro & Bates, 2000; see, especially, chapter 2, pp. 75-). We can compare models with the same random effects (e.g. of subjects or items) but varying in complexity with respect to the fixed effects, i.e. replicable or manipulated variables like item length or participant age, and, separately, models with the same fixed effects but varying random effects. Note that in comparing models varying in random effects, one estimates those effects using restricted maximum likelihood: you will see the argument REML = TRUE in the lmer() function call, that is what REML means. Note that in comparing models varying in fixed effects one must estimate those effects using maximum likelihood: you will see the argument REML = FALSE in the lmer() function call, that is what FALSE means. See comments in Baayen (2008) and Pinheiro & Bates (2000); I will come back to those important terms to focus on understanding, another time, focusing in this post on just writing the code for running the models. We can compare the more and less complex models using the Likelihood Ration Test (LRT) which is executed with the anova([simple model], [more complex model]) function call. A statistic is computed, and evaluated against the distribution to estimate the probability of an increase in model likelihood as large or larger as that observed when comparing the more or less complex model, given the null hypothesis of no gain in likelihood. Note that I log transform the RTs but one might also consider examining the reciprocal RT. # full.lmer2 9 -977.09 -917.98 497.54 9.2541 4 0.05505 . — It is not very pretty but it does tell you what predictors are included in each model you are comparing, for each pair of models being compared, the outcome of the ratio test, giving the numbers I usually report: the and the . — I am looking at this output to see if, for each pair of models, the more complex model fits the data significantly better (if p =< 0.05). –I add predictors in blocks and assess the improvement of fit associated with the whole block. I have made a lot of promises to explain things more another time. So I will add one more. Pinheiro & Bates (2000; p. 88) argue that Likelihood Ratio Test comparisons of models varying in fixed effects tend to be anticonservative i.e. will see you observe significant differences in model fit more often than you should. I think they are talking, especially, about situations in which the number of model parameter differences (differences between the complex model and the nested simpler model) is large relative to the number of observations. This is not really a worry for this dataset, but I will come back to the substance of this view, and alternatives to the approach taken here. 2. to the presence of outlier observations — making the check by removing observations associated with large model residuals then rerunning the model. Firstly, I am going to have to do a lot more explaining, for my own sake, and have promised to do so for a wide range of ideas, including those concerning the methods of model fitting, and, especially, the discussion around how one determines the appropriate set of fixed effects. Secondly, that the model code is both simple and – on its face – reasonably intuitive. Baayen, R. H. (2008). 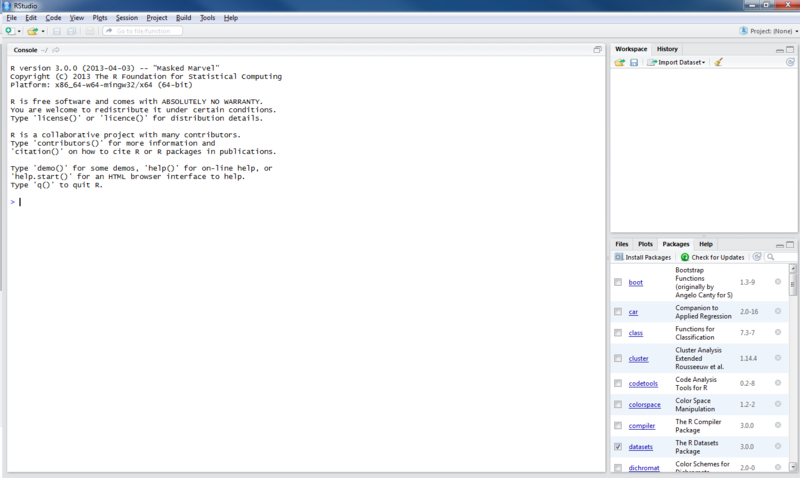 Analyzing linguistic data. Cambridge University Press. Bates, D. M. (2005). Fitting linear mixed models in R. R News, 5, 27-30. Cohen, J., Cohen, P., West, S. G., & Aiken, L. S. (2003). Applied multiple regression/correlation analysis for the behavioural sciences (3rd. edition). Mahwah, NJ: Lawrence Erlbaum Associates. Pinheiro, J. C., & Bates, D. M. (2000). Mixed-effects models in S and S-plus (Statistics and Computing). New York: Springer. We completed a study on the factors that influence visual word recognition performance in lexical decision. We then put together a dataset for analysis here. We examined the distribution of inter-relation of critical variables in that dataset, acting to transform the data where we found indications of concern, here. We will now proceed to analyse the lexical decision reaction times (RTs). The dataset collated in the last post consisted of observations corresponding to correct responses to words only, RTs along with data about the subject and item attributes. It will be recalled that we wish to examine the effects on reading of who is reading and what they are reading. The last collated dataset can be downloaded here. The code I am going to use in this post can be downloaded here. We are going to start by ignoring the random effects structure of the data, i.e. the fact that the data are collected in a repeated measures design where every participant saw every word so that there are dependencies between observations made by each participant (some people are slower than others, and most of their responses will be slower) and dependencies between observations made to each item (some words are harder than others, and will be found to be harder by most readers). What we will do is perform Ordinary Least Squares (OLS) regression with our data, and drawing scatterplots will be quite central to our work (see previous posts here and here). I am going to assume familiarity with correlation and OLS regression (but see previous posts here and here). We are interested in whether our readers are recognizing some words faster than others. Previous research (e.g. Balota et al., 2004) might lead us to expect that they should respond faster to more frequent, shorter, words that are easier to imagine (the referent of). We are also interested in whether individuals vary in how they recognize words. We might expect that readers who score high on standardized reading tests (e.g. the TOWRE) would also respond faster, on average, in the experimental reading task (lexical decision). The interesting question, for me, is whether there is an interaction between the first set of effects — of what is being read — and the second set of effects — who is doing the reading. We have already looked at plots illustrating the relationships between various sets of the predictor variables: scatterplot matrices. We are now going to create a trellis of scatterplots to examine the relationship between each predictor variable and word recognition RT. – I am adding each element, one at a time, making for more lines of code but greater transparency between code and effect. # 1. are RTs affected by item attributes? # 2. are RTs affected by subject attributes? — You can run each set of code to examine the relationships between predictor variables and RT one at a time. The next question obviously is the extent to which these variables make unique contributions to the explanation of variance in reading RT, when taking the other variables into account, and whether we might detect interactions between effects of item attributes like frequency and person attributes like word reading skill. To me, there is a possible interaction such that the frequency effect (LgSUBTLCD) may be getting smaller for older readers but that modulation of frequency by age does not seem very strong. We can perform a full regression on the dataset to look for the effects of interest, effects of subject attributes, of word attributes and of the interactions between the first and the last. We are going to ignore the fact that, due to the dependencies of observations under subject and item, we do not really have as many degrees of freedom as we appear to have (several thousand observations). — Notice also that when you run the model, you get nothing except the model command being repeated (and no error message if this is done right). and — measures of the proportion of variance explained by the model. Let’s call the outcome Y and the predictor X. How much does the way in which the values of Y vary coincide with the way in which values of X vary? We are talking about variability, and that is typically measured in terms of the standard deviation SD or its square the variance . Variances are additive while SDs are not so we typically work with variances. In asking the string of questions given in the foregoing paragraph, we are thinking about a problem that can be expressed like this: what part of Y variance is associated with X (this part will equal the variance of the estimated scores) and what part of Y variance is independent of X (the model error, equal to the variance of the discrepancies between estimated and observed Y)? If there is no relationship between X and Y, our best estimate of Y will be the mean of Y. is the proportion of Y variance associated with X – our predictors. — The estimated regression coefficients represent the rate of change in outcome units per unit change in the predictor variable. — You could multiple the coefficient by a value for the predictor to get an estimate of the outcome for that value e.g. word reading skill is higher by 0.7382 times each unit increase in nonword reading score. — The intercept (the regression constant or Y intercept) represents the estimated outcome when the predictors are equal to zero – you could say, the average outcome value assuming the predictors have no effect, here, a word reading score of 55. For some problems, as here, it is convenient to center the predictor variables by subtracting a variable’s mean value from each of its values. This can help alleviate nonessential collinearity (see here) due to scaling, when working with curvilinear effects terms and interactions, especially (Cohen et al., 2003). If both the outcome and predictor variables have been centered then the intercept will also equal zero. If just the predictor variable is centered then the intercept will equal the mean value for the outcome variable. Where there is no meaningful zero for a predictor (e.g. with age) centering predictors can help the interpretation of results. The slopes of the effects of the predictors are unaffected by centering. S.E. — the standard error of the estimated coefficient of the effect of the predictor. Imagine that we sampled our population many times and estimated the effect each time: those estimates would constitute a sampling distribution for the effect estimate coefficient, and would be approximately normally distributed. The spread of those estimates is given by the SE of the coefficients, which can be calculated in terms of the portion of variance not explained by the model along with the SDs of Y and of X.
Pr(>|t|) — we can then get the probability that a value of t this large or larger by reference to the distribution of t values for the degrees of freedom at hand. As I discuss in my talk, it is not (slides to be uploaded). I have already alluded to the problem. The model makes sense on its face. And the effects estimates might be reasonable. The problem is that we are not really giving the randomness its due here. Did we really have 5250+ independent observations? How accurate are our estimates of the standard errors? The field has long been aware of random variation in datasets like this, where we are examining the effect of e.g. word attributes on the responses of samples of participants in a repeated-measures design. The solution has not been to throw all the data into a regression. Rather, we have averaged responses to each item over participants. To put it another way, for each word, we have averaged over the responses recorded for the participants in our sample, to arrive at an average person response. The folk explanation for this procedure is that we are ‘washing out’ random variation to arrive at a mean response but if you consider discussions by e.g. Raaijmakers et al. (1999) it is not quite that simple (the whole problem turns on the ‘language as fixed effect’ issue, the paper is highly recommended). Let’s look at how this works for our data set. Note I am going to be a bit lazy here and not centre the predictors before performing the analysis nor log transform RTs. You’re welcome to redo the analysis having made that preliminary step. The first thing we need to do is create a database holding by-items mean RTs. We do this by calculating the average RT (over subjects) of responses to each item. How could we take into account both random variation due to items (as in our by-items analysis) and random variation due to subjects? As I discuss in my talk (slides to be uploaded here), discussions by Clark (1973), Raaijmakers et al. (1999) are enlightening. We are heading towards the mixed-effects approach argued by Baayen (2008; Baayen et al., 2008) and many others to do the job. We might consider one last option, to perform a by-items analysis not on by-items mean RT but on the RTs of each participant considered as an individual (seeLorch & Myers, 1990). We might then analyse the coefficients resulting from that per-subjects analysis: see Balota et al. (2004), for one example of this approach; see Snijders & Boskers (1999), also Baayen et al. (2008), for a discussion of the problems with it. — I am switching to the lm() function to run regression analyses — the effect is the same but the function will be a bit simpler to handle. We can use these data to analyse whether coefficients of effects of word attributes estimated separately for each subject are, themselves, estimatble given data about subject attributes. Notice that the effect of frequency does appear to be predicted by the effect of subject nonword reading performance — in line with the frequency x nonword interaction seen in the analysis of the full dataset, above. Harrell Jr, F. J. (2001). Regression modelling strategies: With applications to linear models, logistic regression, survival analysis. New York, NY: Springer. Lorch, R. F., & Myers, J. L. (1990). 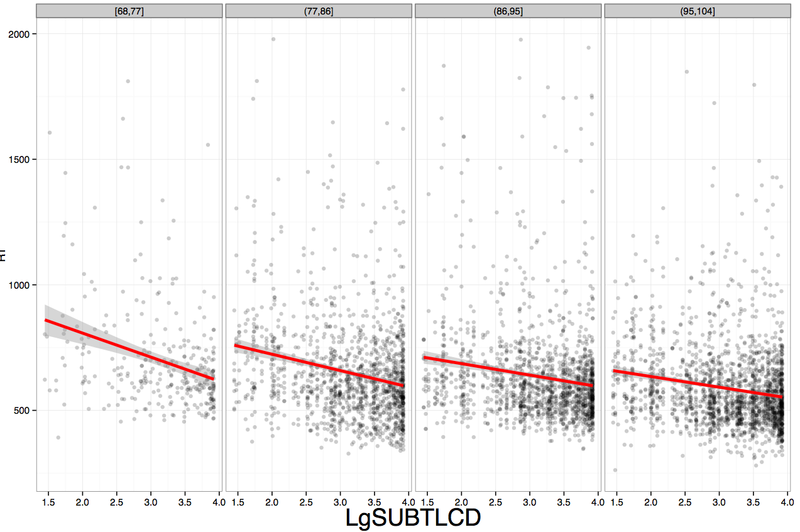 Regression analyses of repeated measures data in cognitive research. Journal of Experimental Psychology: Learning, Memory, and Cognition, 16(1), 149. Raaijmakers, J. G., Schrijnemakers, J., & Gremmen, F. (1999). How to deal with “the language-as-fixed-effect fallacy”: Common misconceptions and alternative solutions. Journal of Memory and Language, 41(3), 416-426. Snijders, T. A. B., & Bosker, R. J. (1999). Multilevel analysis: An introduction to basic and advanced multilevel modelingSage Publications. Thousand Oaks, CA. We got our data together in Part I of this workshop, eventually arriving at the collation of a single dataframe in ‘long format’ holding all our data on subject attributes, item attributes and behavioural responses to words in a lexical decision experiment. That collated database can be downloaded here. The code we will be using in this post can be downloaded from here. We should begin by examining the features of our collated dataset. We shall be familiarising ourselves with the distributions of the variables, looking for evidence of problems in the dataset, and doing transformation or othe operations to handle those problems. Some of the problems are straightforward. We should look at the distributions of scores to check if any errors crept in to the dataset, miscoded or misrecorded observations. Other problems are a little more demanding both to understand and to diagnose and treat. The running example in this workshop requires a regression analysis in which we will be required to enter a number of variables as predictors, including variables characterizing word attributes like the frequency, length and imageability of words. The problem is that all these variables share or overlap in information because words that appear often in the language also tend to be short, easy to imagine, learnt earlier in life and so on. This means that we need to examine the extent to which our predictors cluster, representing overlapping information, and presenting potential problems for our analysis. Much of what follows has been discussed in previous posts here on getting summary statistics and plotting histograms to examine variable distributions, here on plotting multiple histograms in a grid, see also here on histograms and density plots, here on plotting scatterplots to examine bivariate relationships, and here on checking variable clustering. This post constitutes an edited, shortened, version of those previous discussions. I am going to assume you have already downloaded and read in the data files concerning subject and item or word attributes as well as the collated database merging the subject and item attribute data with the behavioural data (see Part I). What we are going to do now is look at the distributions of the key variables in those databases. We can start simply by examining the sumaries for our variables. We want to focus on the variables that will go into our models, so variables like age or TOWRE word or non-word reading score, item length, word frequency, and lexical decision reaction time (RT) to words. 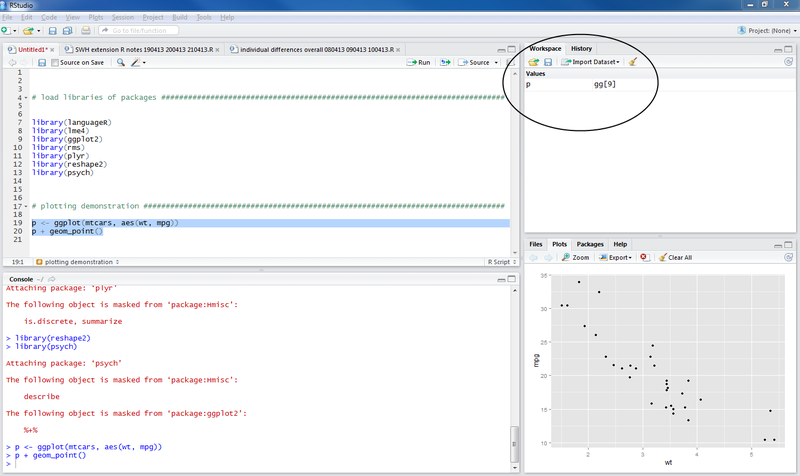 If you have successfully read the relevant data files into the R workspace then you should see them listed by the dataframe names (assigned when you performed the read.csv function calls) in the workspace window in RStudio (top right). Here we are focusing on the data in the subject scores dataframe. As an exercise, you might apply the same functions to the items or the full databases. Notice the values and evaluate if they make sense to you. Examine, in particular, the treatment of factors and numeric variables. Summary statistics are handy, and required for report writing, but plotting distributions will raise awareness of problems in your dataset much more efficiently. We will use ggplot to plot our variables, especially geom_histogram, see the documentation online. — nothing seems wrong with these data – given what we know about the sample. We can move on to examine the distribution of multiple variables simultaneously by producing a grid of histograms, as follows. In Exploratory Data Analysis, we often wish to split a larger dataset into smaller subsets, showing a grid or trellis of small multiples – the same kind of plot, one plot per subset – arranged systematically to allow the reader (maybe you) to discern any patterns, or stand-out features, in the data. Much of what follows is cribbed from the ggplot2 book (Wickham, 2009; pp.115 – ; see also Chang, 2o13). 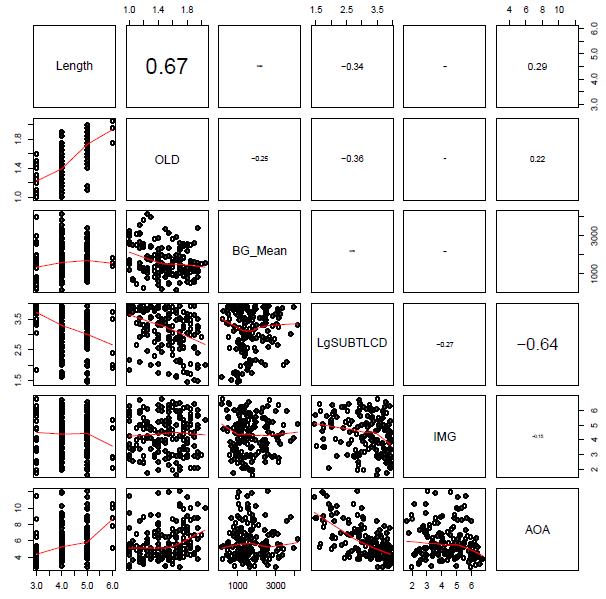 Wickham (2009) advises that arranging multiple plots on a single page involves using grid, an R graphics system, that underlies ggplot2. — I have given each plot a different name. This will matter when we assign plots to places in a grid. — I have changed the syntax a little bit: create a plot then add the layers to the plot; not doing this, ie sticking with the syntax as in the preceding examples, results in an error when we get to print the plots out to the grid; try it out – and wait for the warning to appear in the console window. We have five plots we want to arrange, so let’s ask for a grid of 2 x 3 plots ie two rows of three. As R works through the print() function calls, you will see the Plots window in R-studio fill with plots getting added to the grid you specified. You can get R to generate an output file holding the plot as a .pdf or as a variety of alternatively formatted files. Wickham (2009; p. 151) recommends differing graphic formats for different tasks, e.g. png (72 dpi for the web); dpi = dots per inch i.e. resolution. Most of the time, I output pdfs. You call the pdf() function – a disk-based graphics device -specifying the name of the file to be output, the width and height of the output in inches (don’t know why, but OK), print the plots, and close the device with dev.off(). You can use this code to do that. There is nothing especially concerning about these distributions though the bimodal nature of the age distribution is something worth remembering if age turns out to be a significant predictor of reading reaction times. Histograms are not always the most useful approach to visualizing data distributions. What if you wanted to compare two distributions overlaid on top of each other e.g. distributions of variables that should be similar? It is worth considering density plots, see here. Let’s consider an aspect of the data that, when revealed by a distribution plot (but was also evident when we looked at the summary statistics), will require action. Notice that there are a number of negative RTs. That is. of course, impossible but makes sense if you know that DMDX, the application used to collect lexical decision responses, encodes RTs for errors as negative RTs. Notice also that even if we ignore the -RT values, the RT distribution is, as usual, highly skewed. # how many errors were logged? — You can see that there were a very small number of errors recorded in the experiment, less than 200 errors out of 5000+ trials. This is a not unusual error rate, I think, for a dataset collected with typically developing adult readers. — I am starting to use the script file not just to hold lines of code to perform the analysis, not just to hold the results of analyses that I might redo, but also to comment on what I am seeing as I work. — The ifelse() function is pretty handy, and I have started using it more and more. 1. RTs.norms.subjects$accuracy <- — creates a vector that gets added to the existing dataframe columns, that vector has elements corresponding to the results of a test on each observation in the RT column, a test applied using the ifelse() function, a test that results in a new vector with elements in the correct order for each observation. 2. as.integer() — wraps the ifelse() function in a function call that renders the output of ifelse() as a numeric integer vector; you will remember from a previous post how one can use is. [datatype]() and as. [datatype]() function calls to test or coerce, respectively, the datatype of a vector. 3. ifelse(RTs.norms.subjects$RT > 0, “1”, “0”) — uses the ifelse() function to perform a test on the RT vector such that if it is true that the RT value is greater than 0 then a 1 is returned, if it is not then a 0 is returned, these 1s and 0s encode accuracy and fill up the new vector being created, one element at a time, in an order corresponding to the order in which the RTs are listed. I used to write notes on my analyses on paper, then in a word document (using CTRL-F that will be more searchable), to ensure I had a record of what I did. 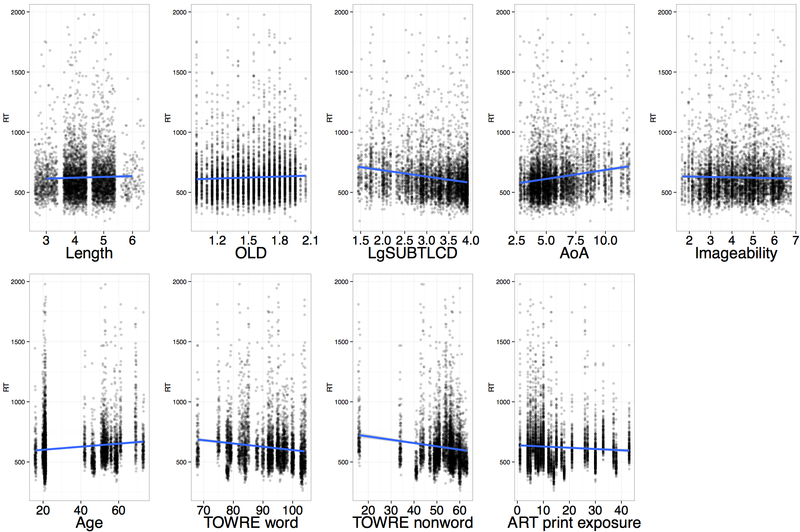 TOWRE_wordacc = "TOWREW", TOWRE_nonwordacc = "TOWRENW", ART_HRminusFR = "ART"
"Length", "OLD", "BG_Mean", "LgSUBTLCD", "IMG", "AOA"
… include some quite strongly overlapping variables, distinguished by high correlation coefficients. I was advised, when I started doing regression analyses, that a rule-of-thumb one can happily use when examining bivariate i.e. pairwise correlations between predictor variables is that there is no multicollinearity to worry about if there are no coefficients greater than however, I can think of no statistical reason for this number, while Baayen (2008) recommends using the condition number, kappa, as a diagnostic measure, based on Belsley et al.’s (1980) arguments that pairwise correlations do not reveal the real, underlying, structure of latent factors (i.e. principal components of which collinear variables are transformations or expressions). If we calculate the condition number for, separately, the subject predictors and the item predictors, we get values of 30+ in each case. Baayen (2008) comments that (if memory serves) a condition number higher than 12 indicates a dangerous level of multicollinearity. However, Cohen et al. (2003) comment that while 12 or so might be a risky kappa there are no strong statistical reasons for setting the thresholds for a ‘good’ or a ‘bad’ condition number; one cannot apply the test thoughtlessly. That said, 30+ does not look good. The condition number is based around Principal Components Analysis (PCA) and I think it is worth considering the outcome of such an analysis over predictor variables when examining the multicollinearity of those variables. PCA will often show that set of several item attribute predictors will often relate quite strongly to a set of maybe four orthogonal components: something to do with frequency/experience; something relating to age or meaning; something relating to word length and orthographic similarity; and maybe some thing relating to sublexical unit frequency. However, as noted previously, Cohen et al. (2003) provide good arguments for being cautious about performing a principal components regression in response to a state of high collinearity among your predictors, including problems relating to the interpretability of findings. One perhaps partial means to alleviate the collinearity indicated may be to center predictor variables on their means. Centering variables is helpful, also, for the interpretation of effects where 0 on the raw variables is not meaningful e.g. noone has an age of 0 years, no word has a length of 0 letters. With centered variables, if there is an effect then one can say that for unit increase in the predictor variable (where 0 for the variable is now equal to the mean for the sample, because of centering), there is a change in the outcome, on average, equal to the coefficient estimated for the effect. Centering variables is helpful, especially, when we are dealing with interactions. Cohen et al. (2003) note that the collinearity between predictors and interaction terms is reduced (this is reduction of nonessential collinearity, due to scaling) if predictors are centered. Note that interactions are represented by the multiplicative product of their component variables. You will often see an interaction represented as “age x word length effects”, the “x” reflects the fact that for the interaction of age by length effects the interaction term is entered in the analysis as the product of the age and length variables. In addition, centering again helps with the interpretation of effects because if an interaction is significant then one must interpret the effect of one variable in the interaction while taking into account the other variable (or variables) involved in the interaction (Cohen et al., 2003; see, also, Gelman & Hill, 2007). As that is the case, if we center our variables and the interaction as well as the main effects are significant, say, in our example, the age, length and age x length effects, then we might look at the age effect and interpret it by reporting that for unit change in age the effect is equal to the coefficient while the effect of length is held constant (i.e. at 0, its mean). 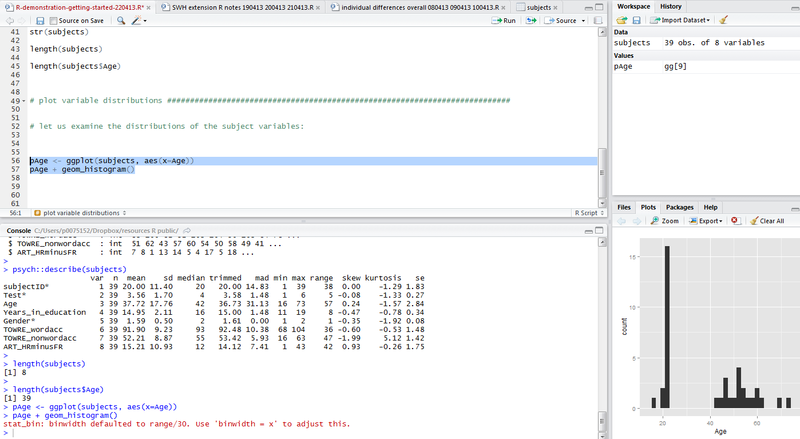 As you would expect, you can center variables in R very easily, we will use one method, which is to employ the scale() function, specifying that we want variables to be centered on their means, and that we want the results of that operation to be added to the dataframe as centered variables. Note that by centering on their means, I mean we take the mean for a variable and subtract it from each value observed for that variable. We could center variables by standardizing them, where we both subtract the mean and divide the variable by its standard deviation (see Gelman & Hill’s 2007, recommendations) but we will look at that another time. "cLength", "cOLD", "cBG_Mean", "cLgSUBTLCD", "cIMG", "cAOA"
— I check the condition numbers for the predictors after centering and it appears that they are significantly reduced. — I am not sure that that reduction can possibly be the end of the collinearity issue, but I shall take that result and run with it, for now. — I also think that it would be appropriate to examine collinearity with both the centered variables and the interactions involving those predictors but that, too, can be left for another time. — How to inspect the dataframe object using functions like summary() or describe(). 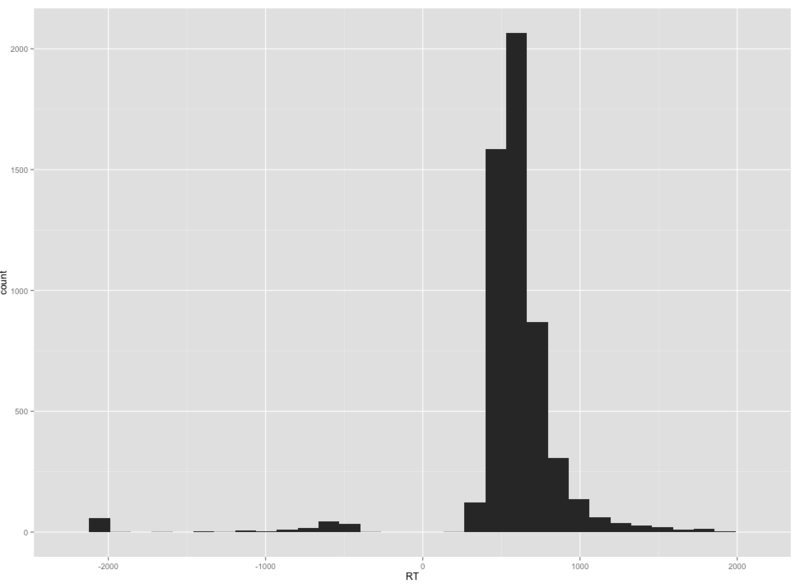 — How to plot histograms to examine the distributions of variables. — How to use grid() to plot multiple variables at once. — How to output our plots as a pdf for later use. — How to subset dataframes conditionally. — How to log transform variables. — How to create a variable conditionally dependent on values in another variable. Chang, W. (2013). R Graphics Cookbook. Sebastopol, CA: o’Reilly Media. Dalgaard, P. (2008). Introductory statistics with R (2nd. Edition). Springer.